Boxing Day 2015 was one to remember and unfortunately for all the wrong reasons. Sadly we received a shocking phonecall telling us that our yard was on fire and that we should come down to see the damage. 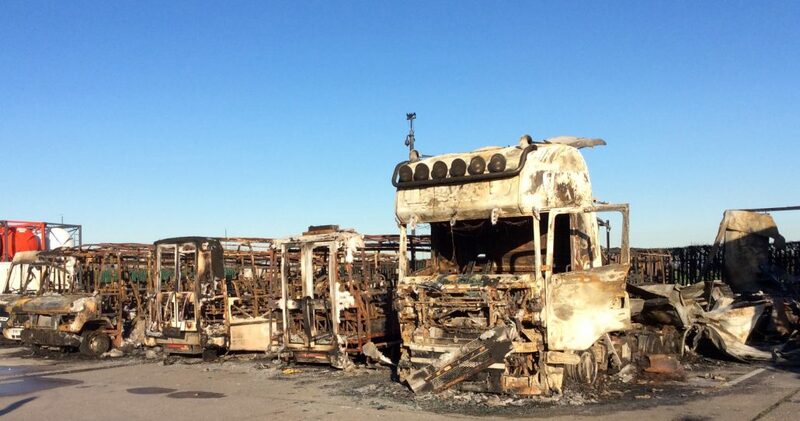 When we arrived it was worse than we expected and half of our fleet of 12 had been burned to nothing as the HGV that we were parked next to had caught fire. We were thankful that nobody was hurt in the fire but we were all devastated as half of our 18+ years of hard work had gone up in flames in the space of ten minutes. Luckily our other 6 vehicles were parked on the other side of the yard so they were saved. Sadly we were dealt another blow when we were told by our insurance company that due to The Fire Metropolis Act 1774 we would be unable to claim for all of our losses off the HGV’s insurance unless he was found to have done something negligent- unfortunately over 12 months on this is still with the legal team. We now had a big task ahead of us to try and sort everything out before all of our school contracts returned a week later. Being a family run business we all rallied round and worked together and managed to hire some buses from local operators and subcontract some of our bookings to other companies. We would like to give a special mention to Formby Coaches, Ashley Travel, Southport Coaches and XL Travel who all helped us massively throughout January and the following months- we couldn’t have done it without you! It’s nice to know that although we are all competitors in the local area we can all help eachother in times of need and we will always be grateful to them all for their help. We were also overwhelmed by the amount of well wishes from the local community and our regular customer’s one of which sent us the following quote “when you are hardest hit you mustn’t quit” and we really appreciated this. Thankfully by the end of March, 3 months on from the fire, and after months of arguing with our insurance company, we had replaced all 6 vehicles albeit mostly at our own cost. We are proud to have carried on through what was a very tough time and fulfilled all bookings and school contracts and we are now striving onwards and upwards and celebrating our 20th anniversary in March 2017. Fire forensic experts were supposed to investigate and see if there was any way the fire started due to negligence but unfortunately in May 2017 we were devastated when we were told the salvage company had destroyed the remains of the HGV by mistake meaning there was no hope in recovering any of the costs we had incurred. We have now come to terms with this and are looking forward to the future.